We often get asked about the options for binding books and what are the most popular book sizes. Booklet printing is available in full colour and b&w and the most common sizes are 5.5×8.5 and 8.5×11. 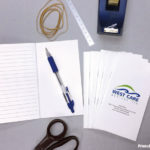 Your cover can be printed on the same weight of paper as the inside sheets or on heavy card stock. Paper options range from glossy, matte, uncoated, linen, felt and recycled. 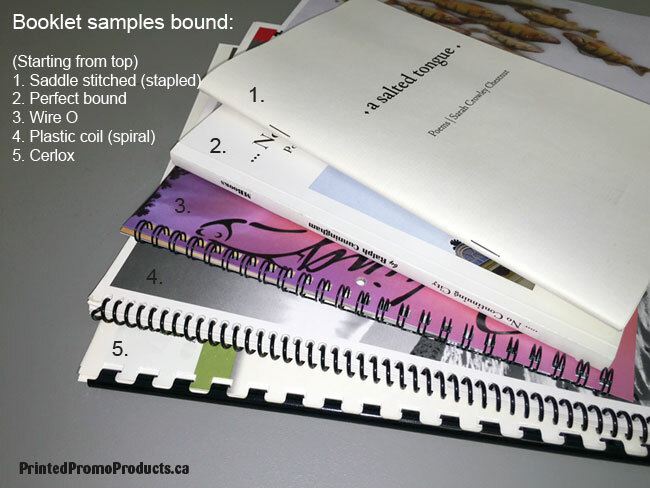 As for the assembly portion, we can saddle stitch (staple), coil bound, wire O bound or cerlox bound your book. We also offer perfect binding which is best suited for books that are at least 60 pages. No matter if you are looking to get your book of poems printed, newsletters, catalogues or price lists, we can help you out. Contact us for a quote on your next project. We deliver to individuals and businesses across Canada daily, small towns to large cities. We have accounts with a number of local and leading couriers including FedEx, Purolator, UPS, Canpar and Canada Post. So delivering to Victoria, Edmonton, Calgary, Regina, Winnipeg, Montreal, Toronto or Halifax is no problem. We can also take care of your shipping needs to the USA. We have added a number of new promotional products to our line this year. These products can help with brand recognition and make great giveaways, gifts and wedding favors. Click on the promo product below to visit the Product page for pricing and more details. Contact us if you have any questions. Custom bottle openers are a great way to get your brand or cause noticed. 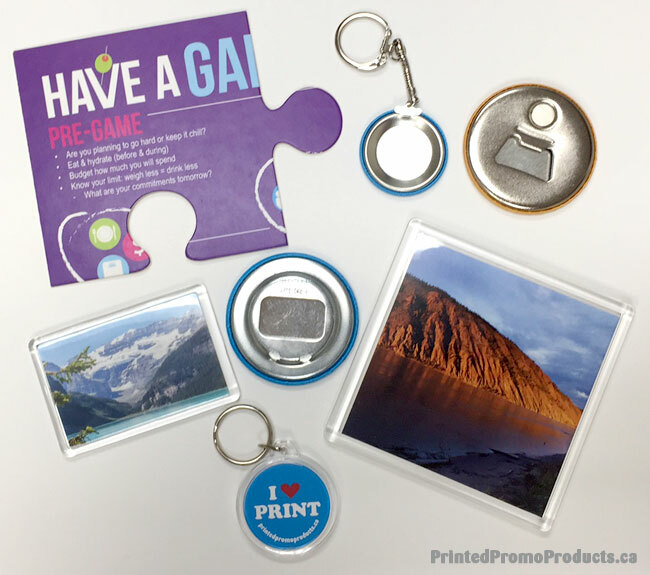 These promotional items make great giveaways and thank you’s and are available with a keychain and magnetic back. With a beautiful gloss laminated finish, your full colour beer openers will make a lasting impression. Uses: wedding favours, trade show and convention giveaways, party gifts, brand recognition, stag gifts and much more. Visit our Bottle Opener page for more details, pricing and templates. Contact us if you have any questions. Custom buttons are great mediums to get your message and brand noticed and bring awareness to your cause. Buttons are available in various sizes and shapes and the low cost per unit makes them very affordable and effective advertising tools. Pin buttons are the most common. They can be attached to clothing, backpacks, cork boards, displays and much more. Some people don’t want the small pinholes in their clothes though so the use of garment magnets or badge clips are perfect for clothing. 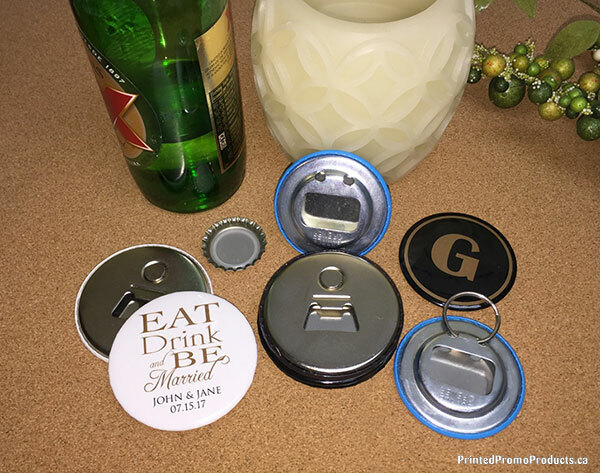 Changing the backing on buttons can transform this promotional product into pocket mirrors, bottle openers and key chains. All of which make eye catching and unique promo items. Buttons can also be made into button magnets by adding ceramic, neodymium or full magnets. We have also made buttons with no pins to be used as custom poker chips and placement markers. With all the different backing options available, promo buttons are really versatile and useful items and the uses keep growing. Visit our Buttons page for more details and pricing. If you have any questions please contact us. Minimum order is 25 units. 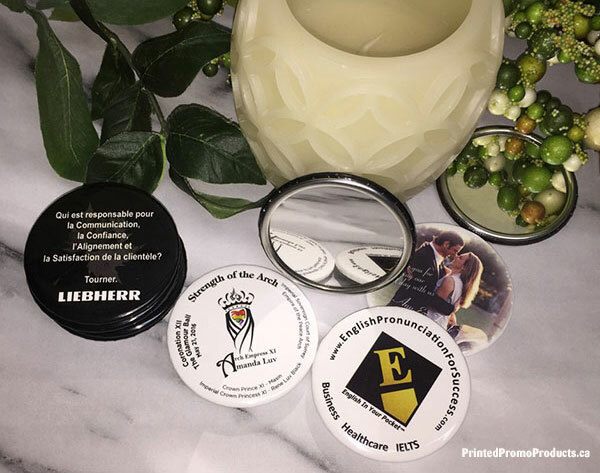 Pocket mirrors are eye-catching, unique promotional items that make great keepsakes. Great for the cosmetic industry as well as perfect thank you’s and giveaways. • Custom printed in full colour (CMYK) with a brilliant, crystal clear gloss laminate that will enhance your artwork. • Production time is 5 to 7 working days. • Printed and assembled on site at our Vancouver, Canada location. • Priced per unit (F). Contact us if you have any questions. Visit our Pocket Mirrors page for the template. Our most popular holiday gifts are versatile, can be used all year long and provide maximum exposure of your brand. • Magnetic Memo Boards are available in various sizes with a full magnet back or corner magnets. Quality laminated surface suitable for dry erase pens. 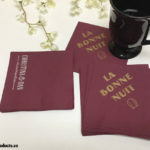 • Cork or Rubber Drink Coasters are long lasting and durable. Available with a brilliant gloss or matte laminate. 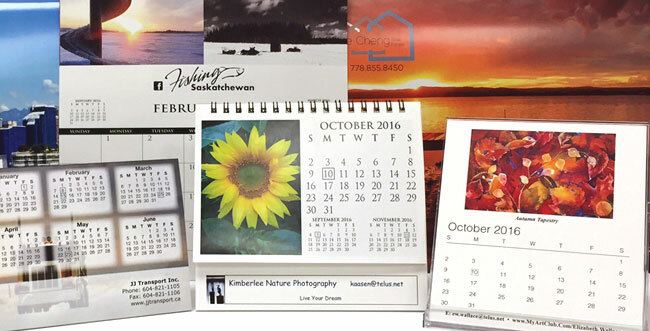 • Custom Calendars come in various sizes and a multitude of types including desktop, wall, magnetic and pocket. • Mouse Pads are available in 3 sizes with a durable surface with rubber or low tack adhesive back. 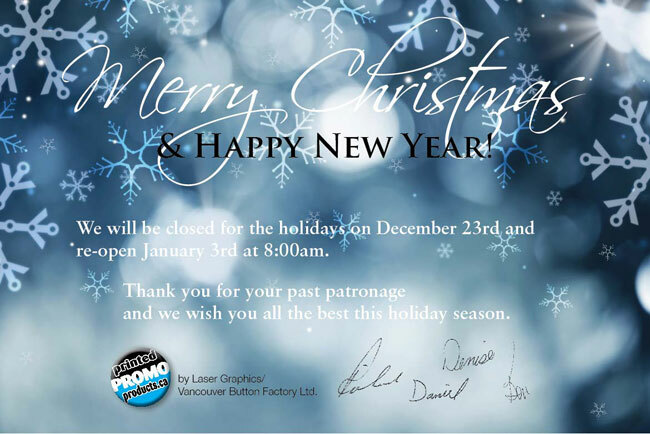 We can also custom print holiday cards and envelopes. Contact us if you have any questions or need a quote. 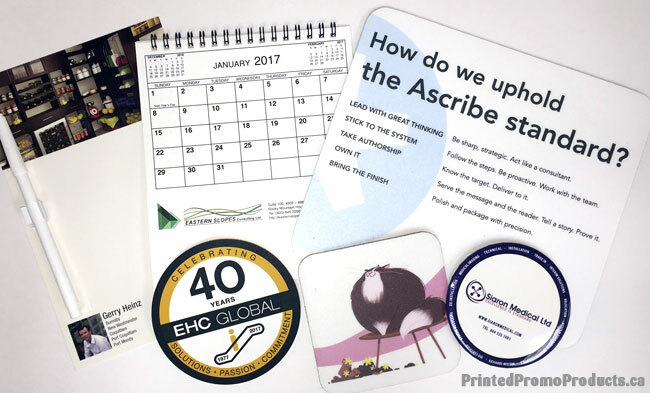 Calendar season is upon us and now is a good time to look into which custom calendar will best suit your needs. We produce a wide variety of sizes and types with low minimums and also provide design services. We can place your custom photos, logo and contact info on our templates or you can provide custom designs with everything in place. If you’re interested in custom calendars please visit our Calendar page for more details and pricing. If you don’t see the type of calendar you’re looking for or have any questions, please contact us. 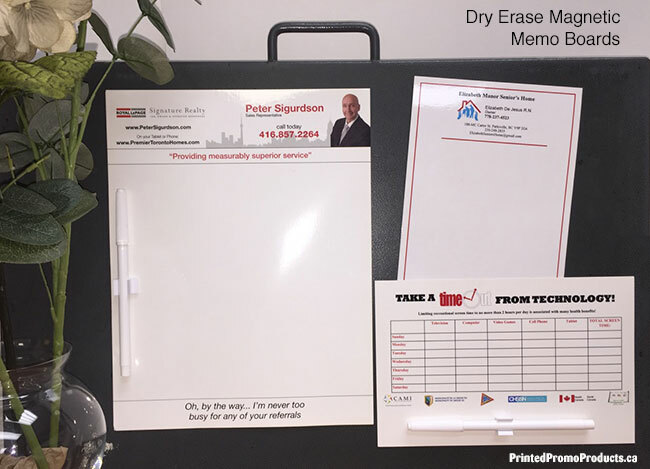 Custom dry erase boards are great for jotting down notes, they make useful weekly planners and perfect promotional products to add your brand and tag line. • Printed in full colour (CMYK) on rigid board. Overall thickness 18pt. • Gloss laminated surface is suitable to write on with dry erase pens and easily wipes clean with a dry tissue. See below for prices on pens. • 4 corner magnets on back. • Based on press ready artwork supplied. If you have any questions please contact us or visit our Magnets page for more details. 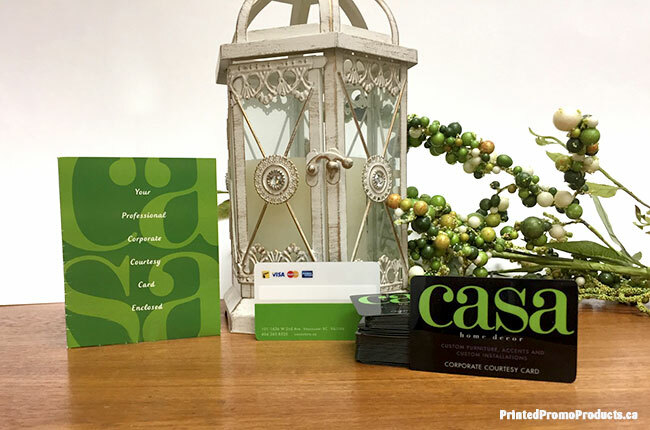 Plastic cards are impressive promotional products that can be used for gift cards, VIP cards, loyalty cards, membership cards and much more. Our plastic cards are digital printed in full colour with gloss lamination on both sides that will enhance your artwork and provide protection. 1 sided and 2 sided printing is available with the option of numbering and a signature strip. Card holders are also available. 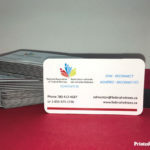 Visit our Plastic Cards/Card Holders page for more details and pricing. Contact us if you have any questions.